These little Jack-O-Lantern flower pots are such a cute Halloween craft! My daughters absolutely LOVED making them. Then the fun continued as they got to pick out plants and then get their hands dirty as we planted them. 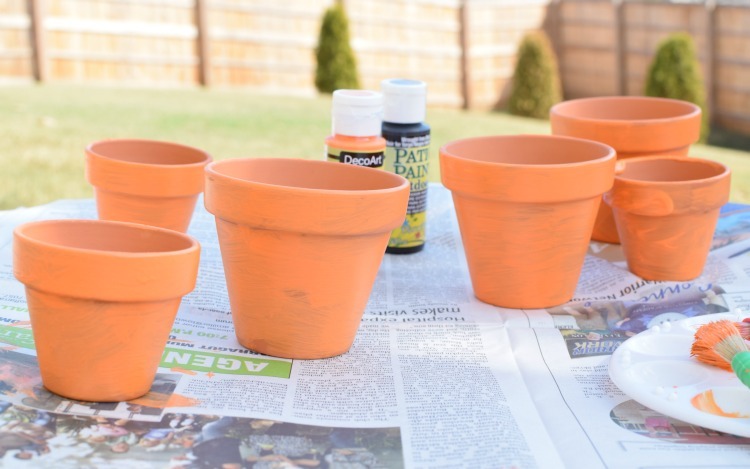 These sweet pumpkin planters will be perfect to put on your porch for the Halloween season, and I know your kids will love this project as much as mine did! 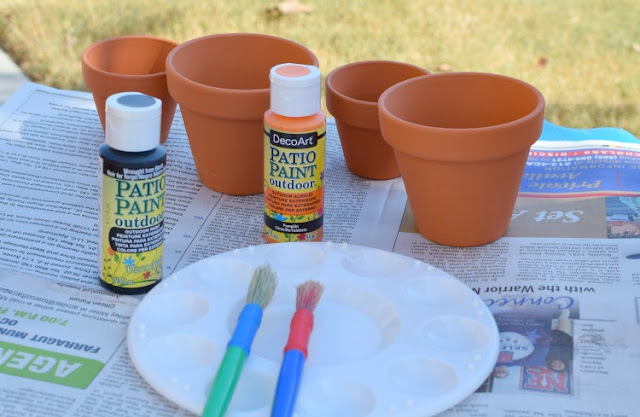 Get set up to paint! 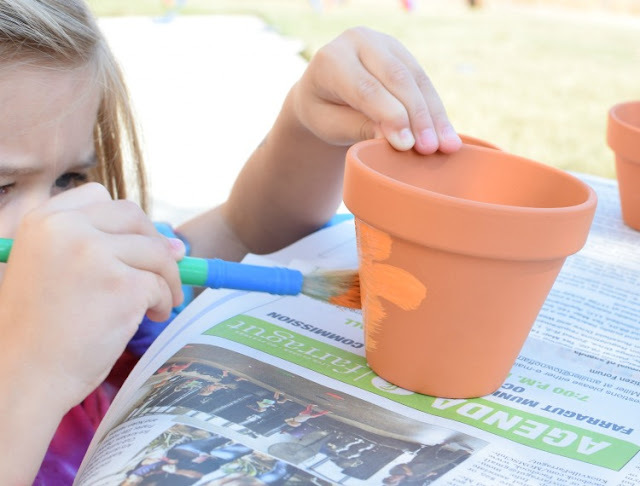 Since acrylic paints are definitely not washable, we moved this project outside. Cover your work surface with newspaper. 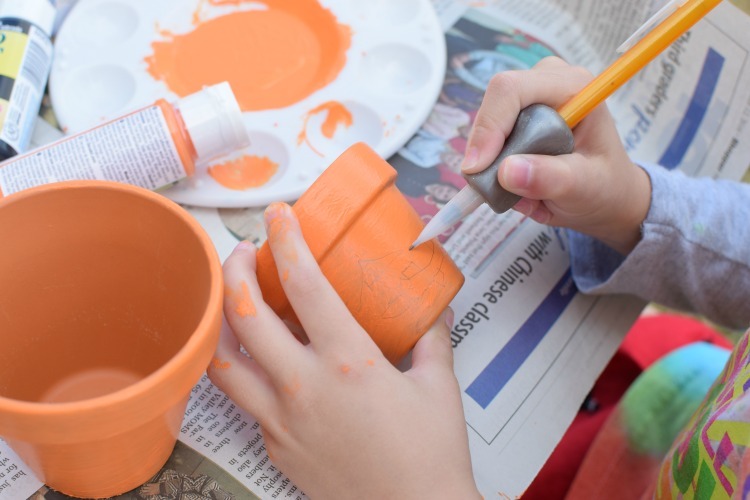 Squeeze plenty of paint out onto a palette or paper plate. Paint your pots orange! We ended up using 2 coats of paint (let the pots dry between coats) to smooth out streaks and inconsistencies. Let the pots dry. I was surprised by how fast the paint dried. I think the terra cotta soaks up most of the moisture of the paint. 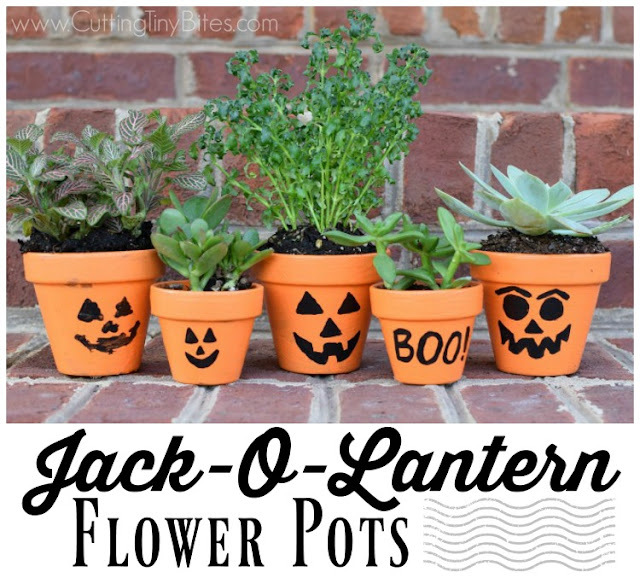 Let your child draw a jack-o-lantern face on the pots lightly in pencil. My girls practiced first on paper. My four-year-old, Maggie, wasn't happy with her faces. She told me what kind of face she wanted and I did hers for her as she closely supervised. 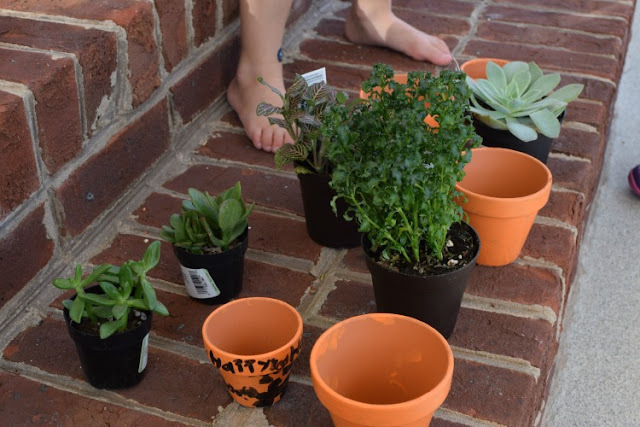 For preschoolers, larger pots would probably be a better option. Ours were 3.5" and 2.5", and they were challenging, but manageable, for my first grader to paint. Use a tiny little brush to fill in the jack-o-lantern face with black paint. My daughters loved going to the garden center with me to pick out some plants to put in our flower pots. 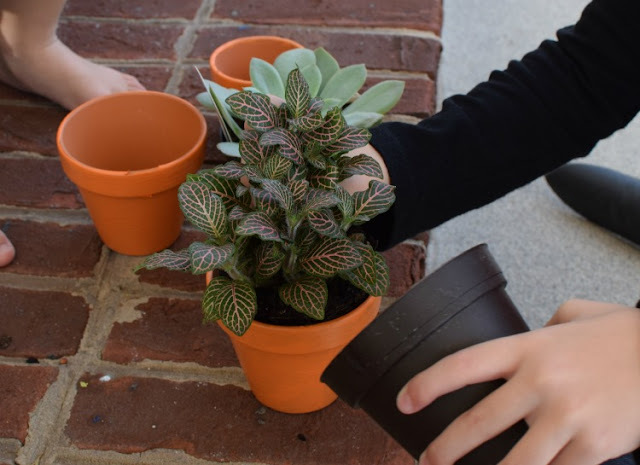 Since it is will into fall, we picked easy-care, indoor plants so that we'll be able to enjoy them for a while. Show your child how to gently transfer the pot from one container to the other. Pack the soil around, and water the plants to help them get settled in. Aren't they adorable?! Make a whole slew of them! 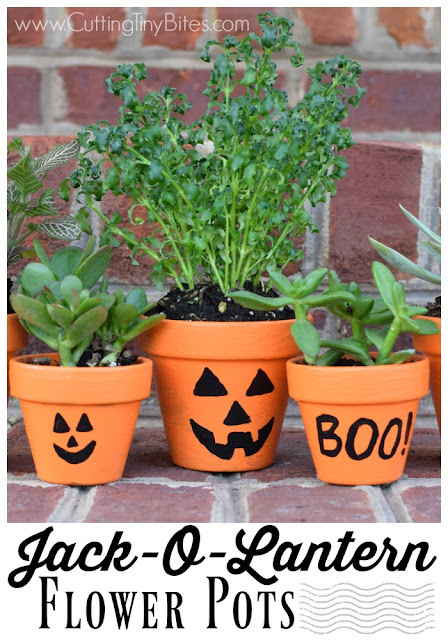 Jack-O-Lantern Flower Pots - Kid's craft for Halloween. 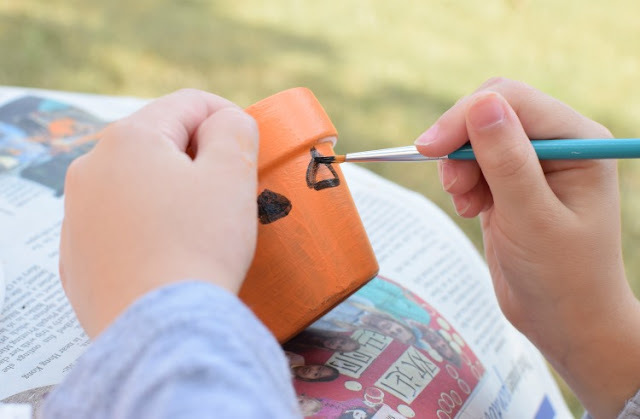 Children will love painting friendly or spooky jack-o-lantern faces! 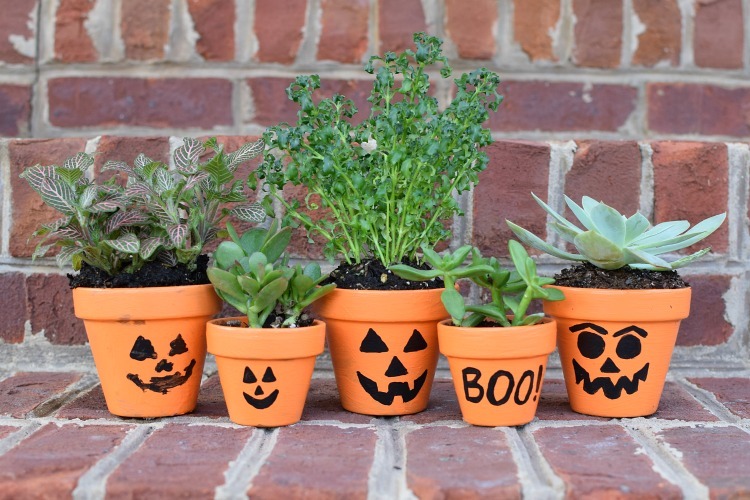 Great activity for kindergarten or elementary kids.